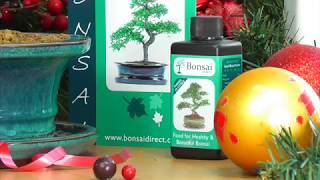 This is a very pretty indoor bonsai tree gift set. Featuring a lovely Sweet Plum bonsai tree with S-Shaped trunk in a cream ceramic bonsai pot. The drip tray, pruning scissors, Merry Christmas tag, care handbook and brass finished mister are all included. We have a delighful collection of gift wrap & personalisation options listed below. This bonsai has a lovely twisty trunk and is potted into a lovely cream ceramic pot.